GlowStep Stow N’ Go slide on truck camper steps are specifically designed to be easily stowed and locked during transit. They eliminate the hassle of removing and storing steps everytime you travel. The Stow N’ Go is the the best way to carry and store your steps, right where you want to use them. They come standard with storage bracket, GlowStep entry system and All Terrain Landing Gear to accommodate any type of terrain. 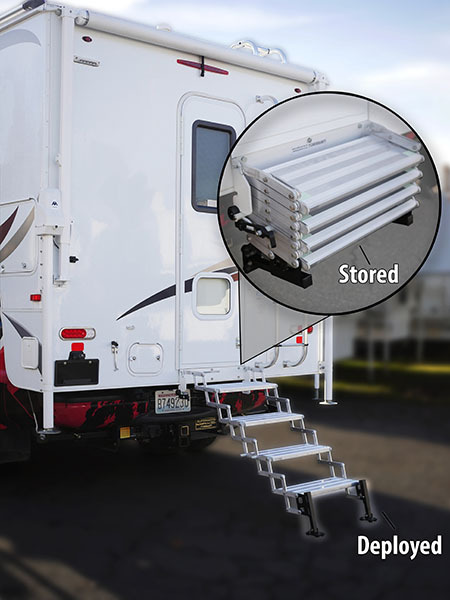 Easily folded up to the stored position the Stow N’ Go steps remain mounted to the back of the slide on truck camper or bumper which helps prevent a dirty RV interior or the need to find a secure place to store your steps to avoid damage during transit. With this convenient step bracket, don’t worry about unnecessary movement of the steps when in transit or driving on rough terrain. The special nylon retainer system of the Stow N’ Go eliminate step movement – steps snap securely into place for storage. As an added bonus, you can also use the GlowStep Locks for theft prevention. The Stow N’ Go steps comes standard with the All Terrain Landing Gear and features adjustable feet that ensure solid placement on any type of terrain. This level of stability is simply unmatched. Can you imagine feeling that kind of step security wherever your slide on camper takes you? By embedding strong and steady step feet to the ground each time you deploy the camper steps, you can safely enter and exit the camper. 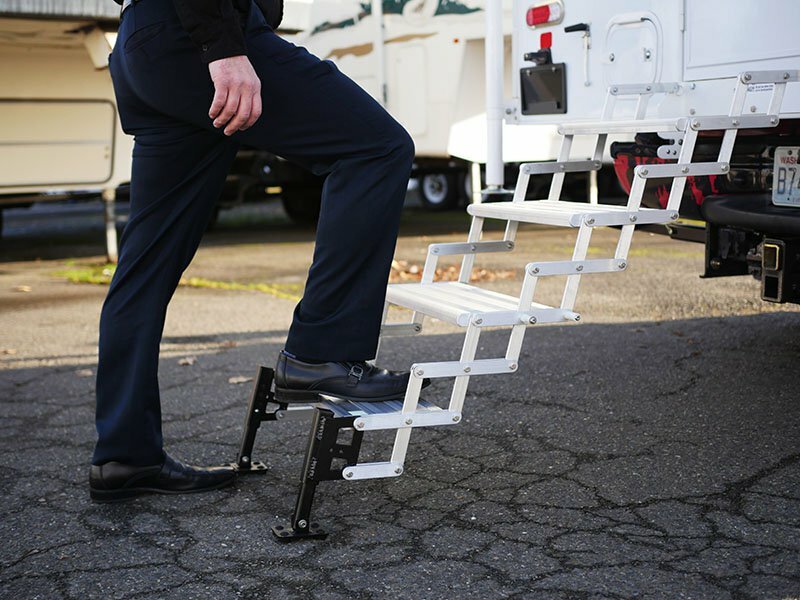 If you already own a set of the GlowSteps, you can choose to purchase just the Stow N’ Go bracket to upgrade your camper steps. This Stow N’ Go system is mounted to a truck camper bumper or to the back of a camper underneath the door. The Stow N’ Go ranges in three to six steps and includes the ability to add or remove steps. To stabilize steps on uneven terrain, the Stow N’ Go comes standard with the All Terrain Landing Gear adjustable feet. •Step 1: Load your camper in your truck bed so your measurement is accurate. If you measure your camper at a different height than intended use, your step measurement will be inaccurate. •Step 2: Determine mounting location. You will need a flat mounting area of 3.5 inches tall and 23 inches wide underneath the truck camper doorway. The steps can also attach to the truck camper bumper. •Step 3: Number of steps. Measure from the desired mounting location to the ground. Use the “Entry Height” measurement ranges on the chart below to find how many steps you need.